All-nighter at the office. Unexpected extended layover at Vancouver International. Pipes freeze over during family Christmas. These aren’t just the times that try men’s souls—they’re also the times that make men stink. 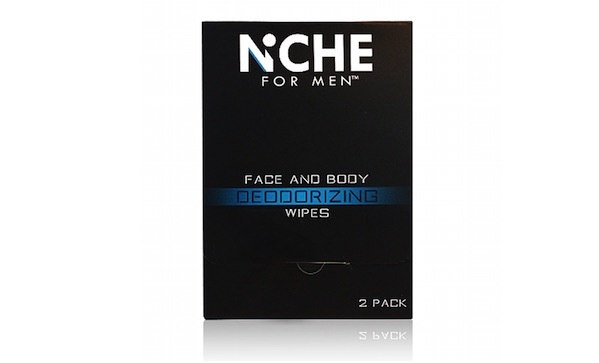 Fortunately, we’ve begun packing Niche for Men Deodorizing Wipes, and you should too. They’re big. Man-sized, even. 10” by 12”, to put a figure on it. We laugh at every other dainty wipe on the market. Contains aloe vera. Also, there’s some ginseng and soothing oils. Truthfully we don’t know what is making our skin feel better, but it’s one of those things. Cologne scent. If you’re in a situation where your shower and regular grooming routine isn’t enough, it serves to reason that you’ll need a cologne booster. Cheap! Ten bucks for a ten-pack. Not for sensitive skin. If you’re the kind of guy who gets razor burn every time he shaves or a rash from deodorant, maybe try something else. By a box and keep on of these individually-wrapped wipes in your golf bag, briefcase, and overnight bag. You can’t always stop life’s little trials, but you don’t have to look dishevelled when you face them.